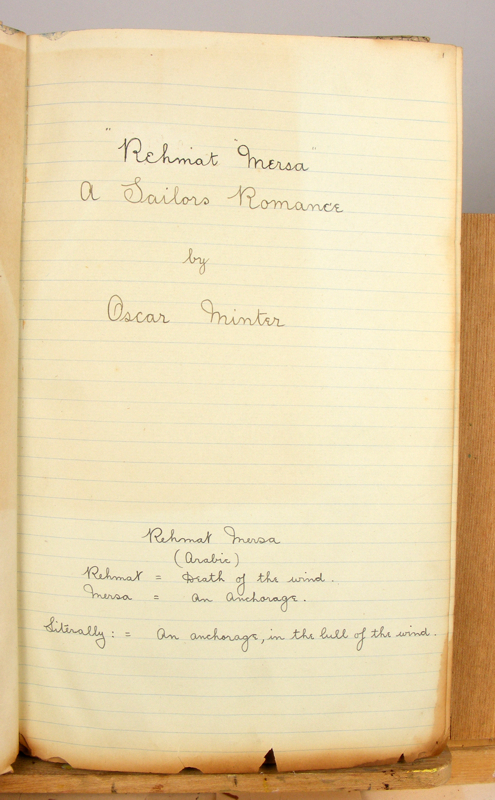 One hundred years ago, in 1915, Captain Oscar Minter Cooper was in the process of writing Rehmat Mersa, which he would finally complete by 1931. 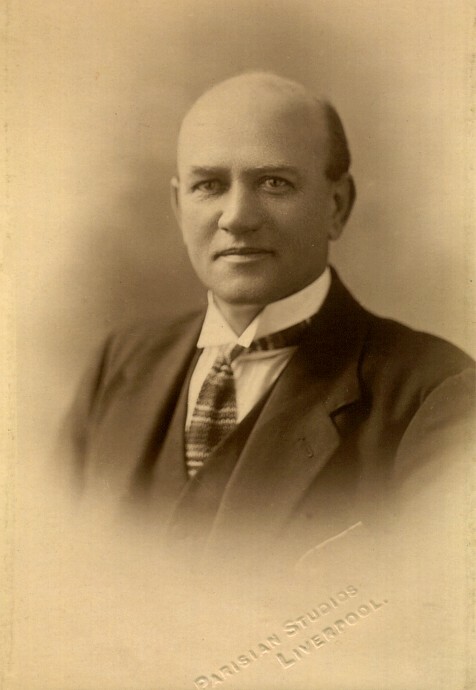 Born in 1880 in Folkestone, Kent, he went to sea at the age of fifteen. He progressed through the ranks, rising to First Mate of the S.S. Trafford Hall, of the Ellerman Line, Liverpool. In 1915, and now the Chief Officer of S.S. City of Nagpur, he helped rescue 496 personnel from the wreck of the S.S. Euphate off the island of Socotra. 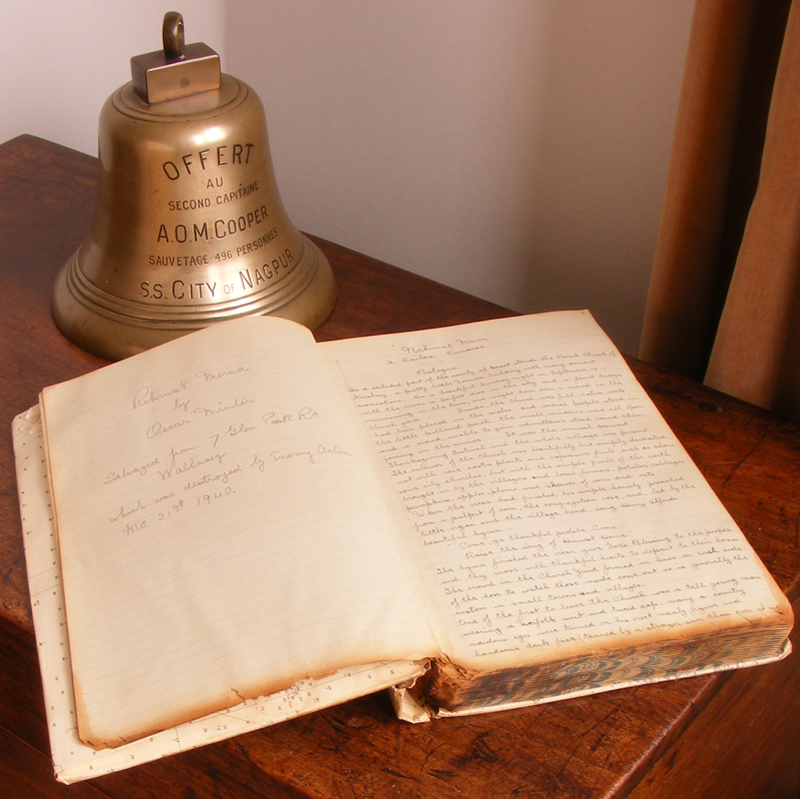 For his part in the rescue he was awarded one of the ship’s bells and the Gold Medal of Honour by the French plus the Marine Gold Medal for Gallantry from the Liverpool Shipwreck and Humane Society. Later that same year he married Eveline, with whom he had three children. In 1927, and at the top of an extraordinary career, he became Captain of the 2nd Duke of Westminster’s ‘Pleasure Palace’, the Flying Cloud. Boarding the ship at Cannes, he oversaw the Golden Years of the yacht at the height of the Roaring Twenties, until sold in 1931. One could imagine him relaxing in his cabin, putting the finishing touches to his novel, then glancing outside to see Churchill, Coco Chanel, or even the Duke himself playing games on deck. What an amazing time he must have experienced and witnessed. After this he served as Master of the steam yacht Melisande, then became President of the Mercantile Marine Association in Liverpool. He died in Wallasey in 1952. The novel was started around 1914. 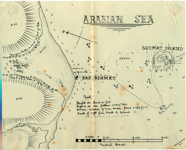 This is taken from the dated map (below) which he drew to show part of the adventure or to plan the action. 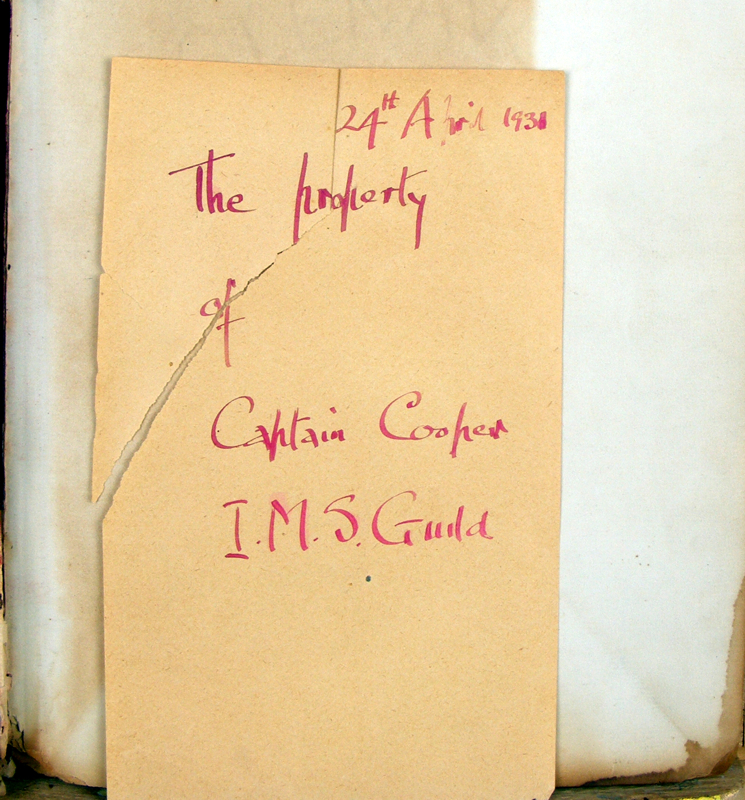 Its completion date is by 1931, which shows inside the cover. It nearly didn't make it much further, when in 1940 his home in Wallasey took a direct hit during the blitz of Liverpool. Fortunately, it was salvaged and the handwritten text survived, just, with only singed outer edges (see pics). Stored away until 1952, it was then handed down to his daughter, Norma. It remained unknown until 2007, when it was re-discovered by the family. Now, in 2015, for the first time, the book has been published. 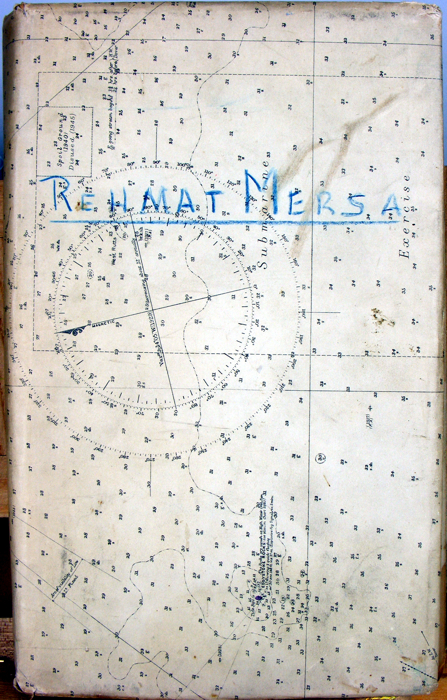 The map cover of the book was added after it salvaged, the title page shows the meaning of Rehmat Mersa. The ms is UK Legal paper size: 8 inches wide, 13 tall, 1.5 deep. Available through Amazon and most good bookshops worldwide. Travelling through the picturesque villages of Hampshire, Harry Croxley arrived at Kinsbury. Here, he decided, he would spend the remainder of his shore leave. A local farmer gave him lodgings and Croxley, keen to have an antidote to three years of voyages to and from Persia, offered his help to work on the land. Then, on the eve of his departure, an accident at the ‘Kinsbury Splash’ brought him to the attention of the beautiful Velia and her brother. This was merely the beginning of a strange and dangerous adventure which took them deep into the heat and sand of Arabia. The pics. Left to Right: Two photo's of Capt. 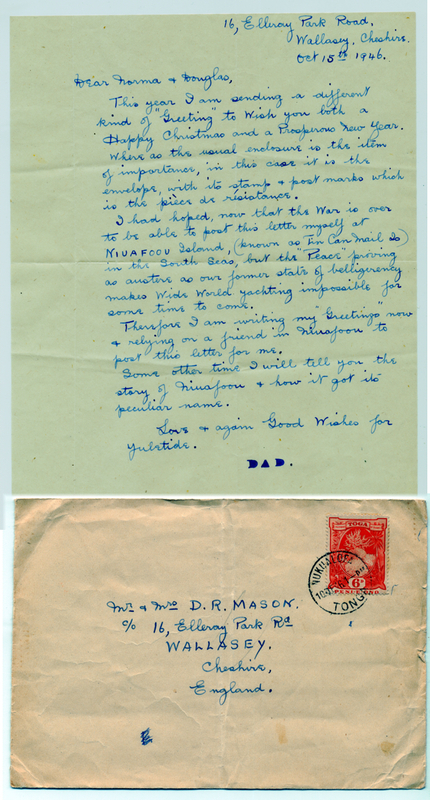 Cooper, The 'Flying Cloud' c. 1927, Letter from 1946--showing he was still at sea at the age of 66, sent to his daughter Norma and her husband, Douglas R. Mason, who were recently married. 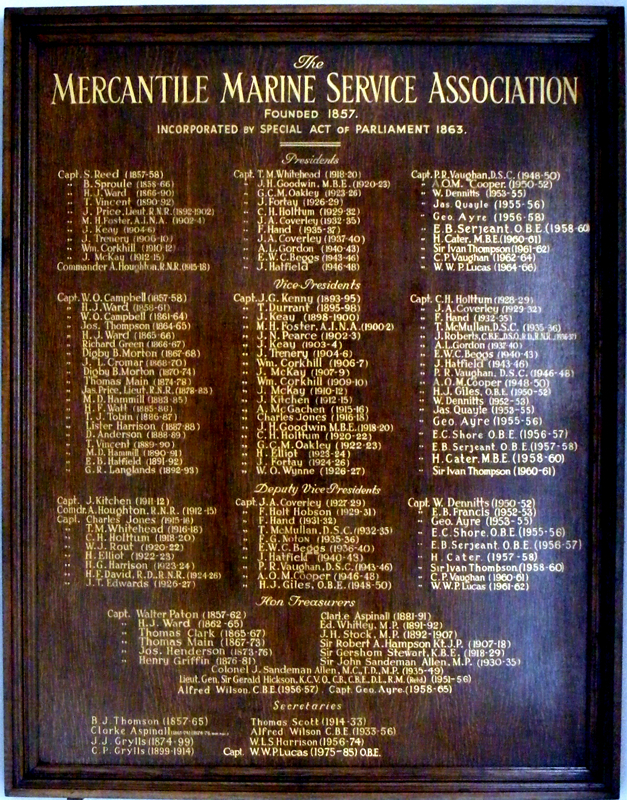 Role of Honour of the Mercantile Marine Service Association, Obituary in the Merchant Navy Journal Oct-Dec 1952 (Thanks to Nautilus UK for these). 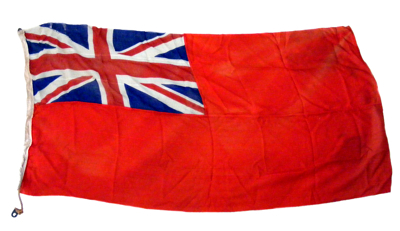 This flag, from one of his ships, was raised by his daughter on the flagpole at the back of his Elleray Park Road house whenever he returned from sea. 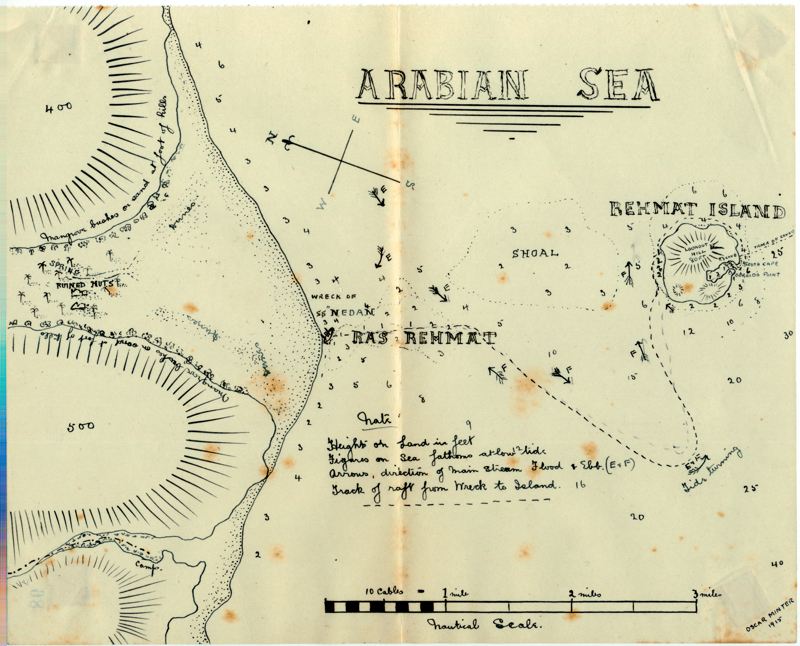 The S.S. Euphrates, of Marseilles, with over 600 people on board, had become stranded on a shoal reef at the eastern end of the island of Socotra on 11th September 1915. At 9.50 p.m, a lifeboat from the stricken vessel was spotted by the S.S. City of Nagpur, of Liverpool, en-route from Suez Bay to Colombo. Picking up the lifeboat, the City of Nagpur made for Socotra. On the following three days boats, led by Chief Officer Cooper, brought off all but one of the passengers and crew of the Euphrates. 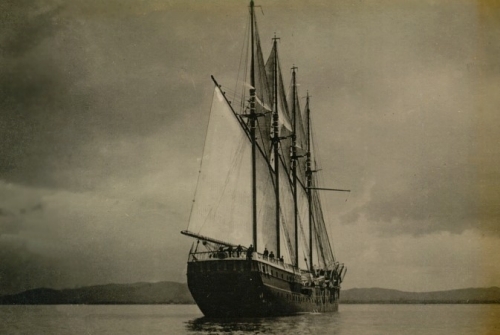 The City of Nagpur was assisted by the steamships Tambora and Collegian. 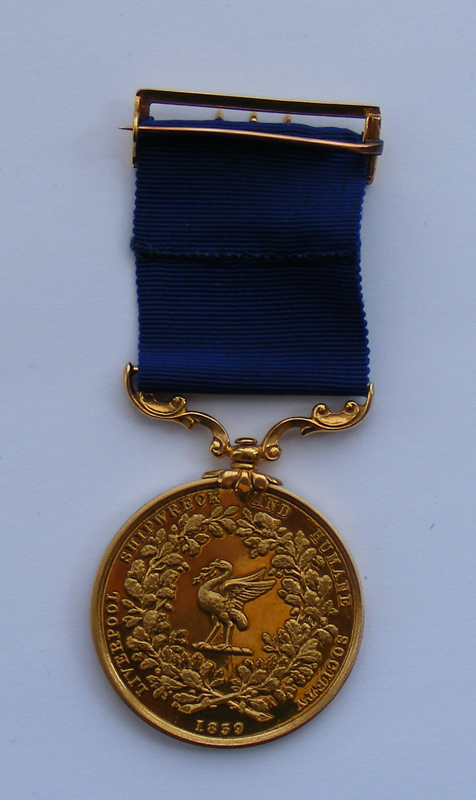 Medal from the Liverpool Shipwreck and Humane Society. 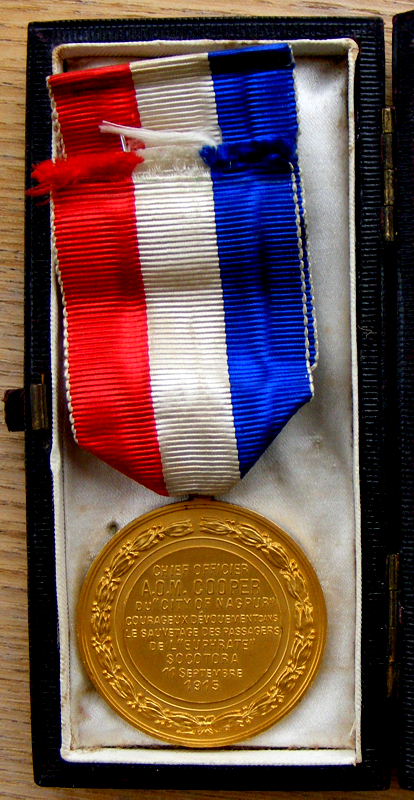 Report (in pdf format) from 1916 detailing the awards made to the crew of the Nagpur and a more detailed account of the action. 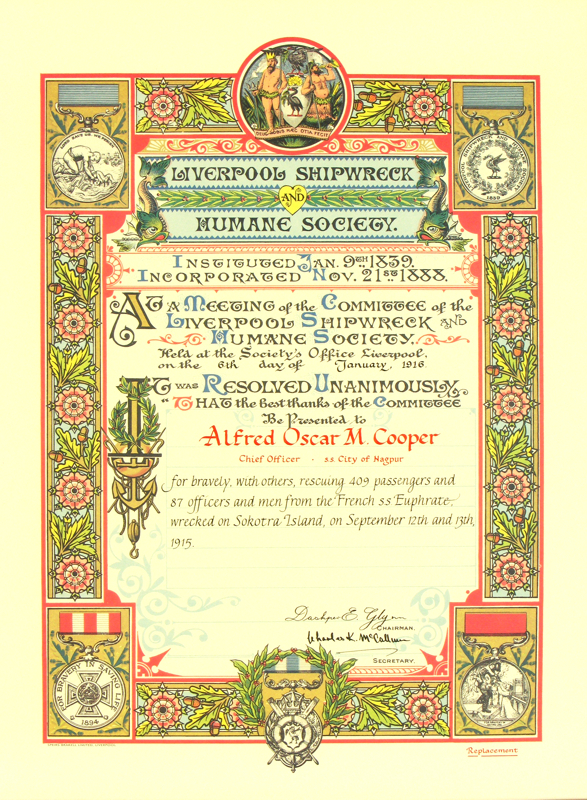 Certificate awarded to Chief Officer Oscar Minter Cooper by LSHS committee (this is a large illuminated certificate 16 3/4" x 12 1/2"). 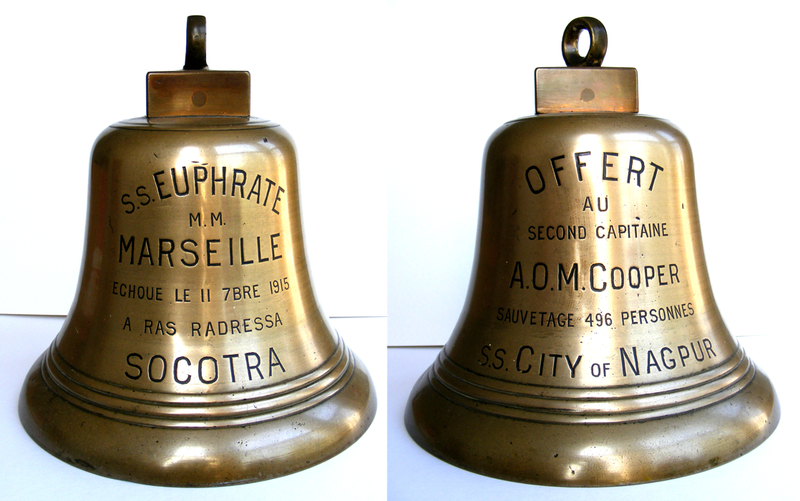 The S.S. Euphrate bell he recieved and the Medal of Honour.